Trapped in the limbo between ideology and conscience, Manbha finds him himself part of a terror outfit. An unexpected opportunity, anger, squalor and disillusionment – followed by and armed combat and injury lead to the soul- searching that form the substance of this moving tale. Born in Shillong, many moons ago, with schooling at Loreto Convent, and an English Honors from St. Edmunds College, PaulamiDuttagupta started her career with All India Radio Shillong. She had written and also given her voice to a few shows there. 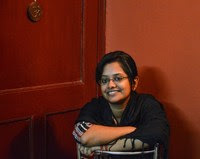 Later she came down to Kolkata and got a post graduate degree in Comparative Literature from Jadavpur University. She had also taken up a fancy to learning Spanish, but today confesses that she has forgotten most of it. Apart from writing full length novels, she has written several short stories and articles. She has also contributed to the “[email protected] Anthology” and the “Family Matters International Anthology” in 2013.